NEW YORK, Oct 18, 2010 / FW/ — Friday night the art and fashion world collided when New York City’s foremost fashion boutique, No. 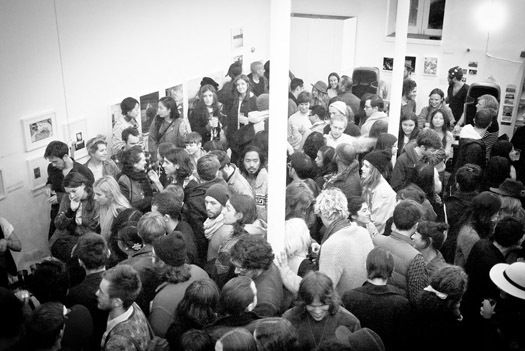 6 and 01 Magazine hosted the 01 Group Exhibition. Following its debut in Toronto, 01 brought New York an eclectic collection of 34 internationally acclaimed artists of mix media. Artists, designers and VIPs sipped on custom Crimson and Clover drinks provided by Kanon Organic Vodka, while enjoying mixed beats by Chances with Wolves. Notable guests in attendance include; Peter Sutherland, David Horvitz, Bree Apperley, Coley Brown, Alana Celii, Nicholas Gottlund, Todd Jordan, Steve Halo, Andrew Laum ann, Jenilee Marigemen, Heather Martin, Bob Myaing, Nathalee Paolinelli, Grant Willing, Wendy Mullin, Judi Rosen, Jason Dill, Bill Strobeck and many others.